Aroma of Positivity: Why do we burn incense sticks in puja? The divine presence is eternal, omnipresent and omnipotent; it’s just our lack of realization that we are not able to remember him each moment. Though we don’t adore him every moment yet we are particular about our traditional values and beliefs. The entire process of worshipping God is fixed by us in a particular manner but do we ever think rationally, why do we do perform a particular ritual? Burning incense stick is an important part of the puja ceremony as per Hindu rituals and here we’ll highlight the cause behind this ritual. The incense sticks acts as an air freshener and rejuvenates the soul of the devotee, who is worshipping. The ambience becomes pious and tranquil due to elimination of evil or ill energies from the environment. The attractive fragrance of the incense stick captivates the mind and soul of the worshipper and helps them to focus on His holy presence. It also acts as a disinfectant to remove insects and flies away from the holy place of worship. 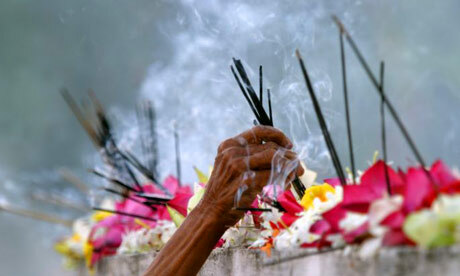 It is also said that these sweet smoky fragrance transmits our messages to the Almighty. The incense sticks inspires us to leave behind our aspirations and surrender ourselves for the benefit of mankind, like it burns itself for us. Thus the tradition of burning camphor or incense stick is not mandatory, yet if you do it then it’s a good practice and these reasons will make you utilise it in a better way. This entry was posted in Puja and tagged astrology, auspicious, blessings, burning, camphor, concentration, devotees, disinfectant, faith, fragrance, have a little faith, Hindu, hindu rituals, hinduism, holy presence, incense sticks, pleasant, pooja, prosperity, puja, puja ceremony, rational, relevance, Scientific, shubhpuja, shubhpuja.com, spirituality, traditional values, worship. 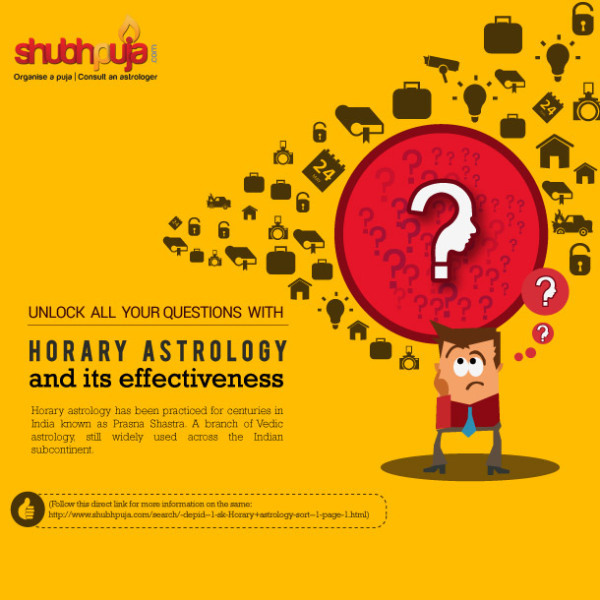 This entry was posted in Astrology, Consultants and tagged astrology, auspicious, bestow, birth chart, blessings, book now, consultation, current situation, date of birth, divine, energy, enlightenment, faith, family, fortune, future, glory, happiness, have a little faith, horary astrology, Kundli, love, planetary position, Prashna kundli, present moment, problems, queries, Scientific, shubhpuja, shubhpuja.com, stellar position, time zone, vedic astrology, Vedic experts. Get dirty, stay healthy! Why should we eat with our hands? Few of us burdened under the weighty words of westernization and globalization are many times compelled to follow few norms, which are against our will and acceptability. Remember those days when mom used to run behind us with a plate and trying to bluff their toddler for feeding them with their own hands. Those heavenly days were mostly cherished by every Indian kid, but here my intentions are to highlight the fact ‘Why were we fed with hands rather than classy cutlery’. Today we have broken those natural essence and jumped on to the modern ways of society, yet for some ‘eating with hands’ is still in trend. Eating with cutlery is thought to be more modern, hygienic and convenient, however most people don’t realise that there is a rationale behind eating food with your hands. According to the Vedas, our hands are the representation of the five elements of nature. So these elements work on your food by cleansing it and preparing us to eat and digest them well. A certain kind of bacteria resides in our hands, mouth, throat, intestine, gut and rest of the digestive system; that saves us from the outside harmful bacteria. So the pattern of bacteria is maintained when you eat through your hands. 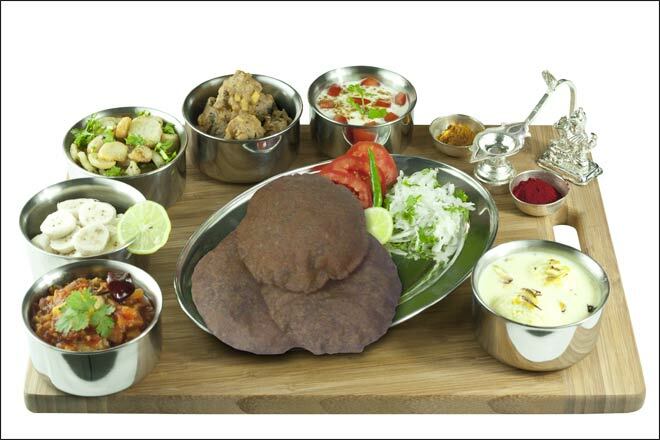 In our Indian culture, it is said that “eating food with your hands feeds not only the body but also the mind and the spirit”. Even our Vedas gives utmost importance to this pattern of eating. The satiety value of food enlarges when one eats with hands rather than spoon or fork. Even while we watch television and eat, our complete senses are involved in the process of eating through hands and we engage ourselves in feeling the texture, warmness and taste of the food. As soon as you touch your food with your hands, the brain signals your stomach that you are about to eat. This in turn, prepares the stomach to digest the food it will receive, aiding in better digestion. People who eat with their hands are more conscious about hygiene than others, thus it inculcate the habit of washing hands and staying clean. It also keeps you away from certain diseases. Eating with hands provides you with another level of awareness and your mind, body and soul are indulged in the entire process making you feel full. This entry was posted in Puja, Rituals and tagged ancestors, auspicious, awareness, bacteria, beneficial, better digestion, blessings, book now, children, clean hands, dharma, dirty, divine, eating with hands, environment, faith, five elements, happiness, have a little faith, healthy, Hindu, hygienic, Indian, indulge in eating, satiety value, scientifc relevance, senses involved, shubhpuja, shubhpuja.com, Tradition, tummy full, Vedas. This entry was posted in Puja and tagged auspicious, blessings, celebration, faith, glory, god, have a little faith, Holi, Holika, holika dahan, pooja, Prahlad, puja, shubhpuja, shubhpuja.com. The colourful hues of love, the pouring drops of peace, the aroma of togetherness and the festive joy of unity in diversity define the warm happiness of HOLI. Abiding by the deep rooted culture and traditions, every day is a joyous fiesta in India; where the festival of colours remains in the priority list forever. Celebrated on a full moon day, in the month of ‘Phalgun‘, the festival is not only a triumph of good over evil but also a celebration of spring and commemorates various events in Hindu mythology. Apart from the usual grand party celebration with friends and family or other cultural merriment, why not be different than others and spread the true-spiritual and scientific message of Holi among all. The eternal epitome of faith and devotion, Prahlad inspires us to be a selfless devotee and surrender ourselves in the arms of holy master. Take a pledge this Holi to give away all your worries to Almighty and become a committed disciple. Remember the reverential relationship between Lord Krishna- Radha and Gopiya? Kindly don’t take them as an excuse and lure innocent beings, as it’s every body’s freedom of choice to be or not to be a part of celebration. Don’t compel others. 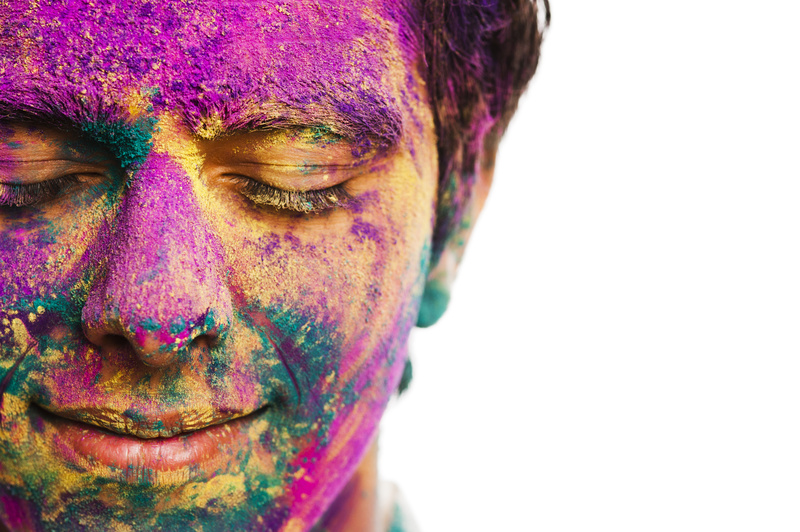 Consuming alcohol or intoxicant substances was never a traditional norm of Holi. Keeping the gun at the shoulders of traditional values is a sin. Drench in the bounty of Supreme energy rather than noxious products. 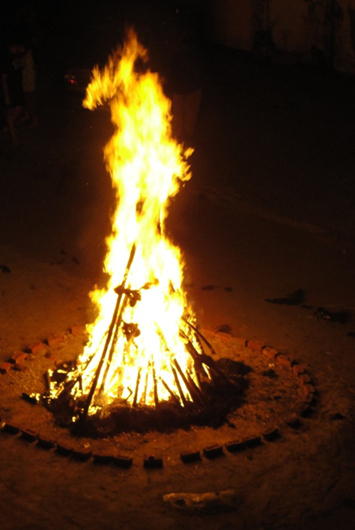 Holika Dahan is a natural remover of bacteria from atmosphere and body but also a reason for deforestation. 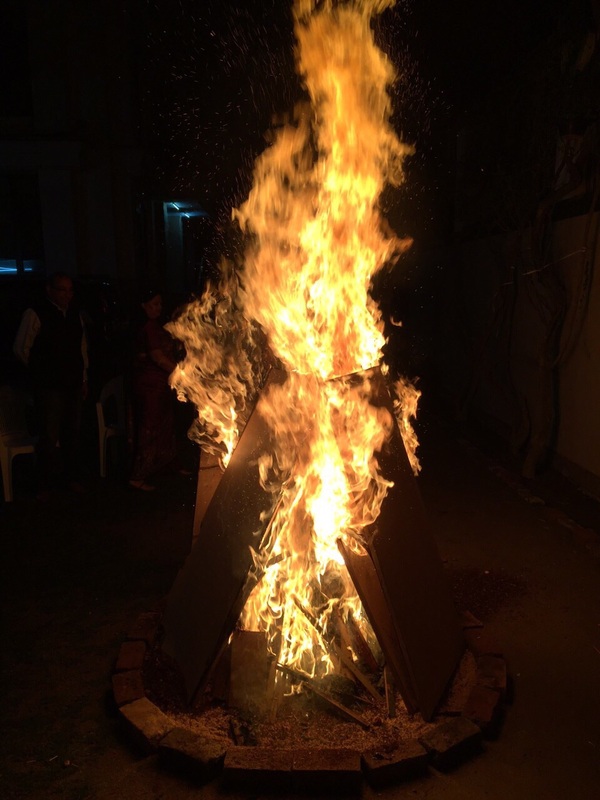 Pool in for few Holika bonfires in your city rather than burning it individually. It’s a festival of colours not of harmful chemicals. Be natural and play safe; just don’t go for hazardous colours available in the market. Realize the significance of water and have some mercy on the water deficient areas. Don’t douse each other with buckets of water or water balloons, either save it for your future generations. Share the happiness of Holi with under privileged kids or neglected old people; spread the valuable message of love by a small celebration with them. It will make a difference. Your mom or grandma will surely prepare the special food delicacies at home, distribute a little with famished kids on the foot paths or streets. You might not value them as much as they will. These tiny efforts from your end will spread a spark of happiness in the entire world and will also enlighten the future foundation of this country by teaching them the act of sharing and helping others. Be a change and set an example for your kids this Holi. Remember, even if you perform just few of the acts mentioned above, I don’t guarantee about worldly happiness but personal contentment will be sure. This entry was posted in Mythology, Puja, Rituals and tagged act of kindness, auspicious, blessings, body, book now, celebration, children, colours, committed disciple, cuisines, festival of colours, gujiya, Holi, holika daha2015, holika dahan, Lord Krishna, March, natural colours, Phalgun, pichkari, play safe, pooja, Prahlad, problems, prosperity, puja, shubhpuja, shubhpuja.com, spirituality, unique ways, water balloons.